After a rainy night, but well lit, run! When I first started running, I was not serious enough nor did I run far enough to think that I would ever be running before the sun came up or after it went down. As I started to run more and added longer runs (6 miles) to my schedule I continued to run only during daylight. All of a sudden my running, and life schedule, changed. I was running longer distances (half and full marathon training runs) and working more hours and seemingly the only way to do both was to get up earlier and/or stay up later. I didn’t mind that some days I’d be running in the dark, I just wanted to be prepared–I wanted to be visible. Last year's model of a Brooks' reflective shirt; worth every penny! A good chunk of my dark runs are in the morning before the sun comes up. In general, I am a morning runner. I prefer to get it out of the way and I think there is no better way to start the day than with a run. It’s a chance to think through the day and at the end I feel as though I’ve already accomplished something. One of my favorite things about morning running is watching the day transform. Things look so different as the sun comes up and puts light on them and watching the world wake up always makes me smile and appreciate what I have. Depending on the run on my schedule, and the season, running in the morning has often meant running before the sun comes up. As soon as I realized I’d be running in areas with traffic as well as with few streetlights, I went to Fleet Feet and bought the brightest shirt they had. The Brooks shirt is relatively lightweight and is perfect to pull over top of a tank, t-shirt, or long-sleeve, and I’ve even pulled over top of my heavier windbreaker on super cold days where I’d be running in the dark. I know it works because I’ve had friends pass me on the road only to tell me later how easy I was to spot. 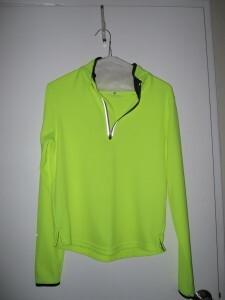 As wonderfully effective as my Brooks shirt is at making me visible, it doesn’t necessarily help me see in the dark. Running in the morning is great because the longer you run, the brighter it gets. I’ve never had an issue seeing what’s in front of me (my poor vision aside) because it’s consistently getting lighter out. I recently had to do some of my runs at night and discovered it’s a whole new kind of running in the dark. For starters, night traffic is much heavier than in the morning because everyone is headed home from work. And of course, nothing is getting brighter as the run goes on. I do think that full moon runs are significantly different than runs during any other lunar phase. I will always be amazed at how much light the moon puts out. But on days when there isn’t a full moon, something else must be done to brighten up the night. This week I did two night runs in a row, the same 5.12 mile route as part of my marathon taper. The first night it was almost 60 degrees, dry, and no wind. I wore shorts and my Brooks reflective shirt and had one of the best runs of my life. However, on some of the side streets in my neighborhood it was a bit darker than my eyes were comfortable with. The next night it was 47 degrees, raining, windy, and still dark. Because of the rain I planned to wear my new super lightweight Patagonia Houdini rain jacket which meant I needed another solution to being visible. Headlamp! wasn’t annoying–it was lightweight and wearing it on top of a fleece hat meant that I couldn’t feel it at all on my head. I’m not sure this gear combo makes me visible from the back, however, and on busier roads that would be a bit concerning. My husband has a reflective strap vest that would be the ideal additional component to my night gear when I can’t run with the reflective shirt. I find it fascinating how different it is to run in the dark than in the daylight. I have one friend who much prefers to run in the dark simply so no one will see her running. While I enjoy being able to see my surroundings during daylight runs, there is something powerful about running in the dark. When I run at dawn I wake up with the world around me. When I run at night I feel like I am on a secret mission and no one can stop me. But no matter how confident I feel running in the dark, I definitely want to be visible. Do you run in the dark? If so, what do you wear to be seen and to be able to see when you run in the dark? 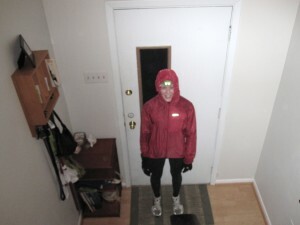 This entry was posted in Articles, Running and tagged dawn runs, dusk runs, reflective gear, running in the dark on November 12, 2009 by Natalie. Most of my running gear is Nike which have reflective trims on my sneakers and shorts. Because running at night is a lot cooler than running during the day, I go for longer runs and wear a fuel belt with reflectors. 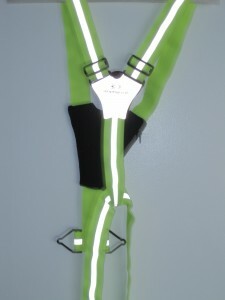 The bright shirt and reflective strap vest are also both great ideas.